If you’re a high performance driver who wants the very best in radar and laser protection, the Stinger VIP is the system that is best for you. You are looking for the best protection technology can offer but you want it to be hassle free. Welcome VIP. Fully integrated protection against every kind of electronically enforced speed traps with the thinnest, most modern, and most effective antenna. The VIP’s alerting is revolutionary in its simplicity. Quiet but loud and clear when it has to be, allowing you to fully focus on driving. Simple pictograms and color coding. At anytime, green means ‘relax’, yellow ‘suppressed alert’ and red ‘full alert’. Tested during our 2015 radar detector and laser jammer shootout, the Stinger VIP detected 33.5 police Ka-band radar 3,300 feet earlier than its closest competitor, the Beltronics STiR Plus. Is the Stinger VIP a Radar Detector? A family owned business from Holland, Stinger began development of its first radar detector over 25 years ago. In 2004, Stinger pioneered the first Patch Array antenna. More recently, Stinger developed its state of the art Stinger VIP, the culmination of nearly three decades of RADAR Detector manufacturing expertise. The Stinger VIP is not a radar detector in the old fashioned sense of the word. Partly due to legal issues surrounding the use of radar detectors in their country, and partly due to important performance advantages, the Stinger VIP was developed as a car computer with a spectrum analyzer, programmed to sweep the radar bands used by police. Another advantage of the Stinger HD antenna system is that it is extremely sensitive to even sniff out the low powered vertically polarized K and Ka band mobile photo vans. Another unique feature of the Stinger VIP system is their touch screen display. Their standard credit card sized display measures only 3.27” x 2.09” x 0.28” and affixes to the Stinger display holder. 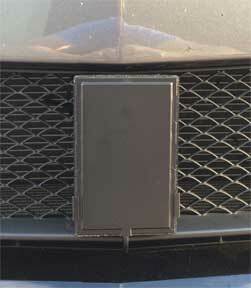 The display holder can be mounted to your dash, center console, or other area within the cabin of your vehicle. Also available as an option, The VIP can be ordered with the laser XL display. Green Display: When not alerting the display is green, displaying the direction you’re traveling, your speed, the time and the operating mode(s). Yellow Display: Once the Stinger picks up a signal that it considers as not direct threat it , alerts yellow, identifying the exact frequency, band, signal strength and the direction of the source. A button on the bottom right of the screen then allows you to lock this alert out based upon the frequency and location if it’s a false alert. Red Display: Here the Stinger system is in full alert mode, identifying the threat level as serious, indicating signal strength, direction and exact frequency while also displaying your speed. Experience target view screens and you will never have to wonder where exactly the speed trap is. It shows whether radar comes from ahead, the side, or the rear (requires front and rear HD Antennas on your car), laser is shot at you from ahead or behind (requires front and rear Lasers on your car), and has a proximity indicator for SpotList alerts. European company apart from the pack. Whereas other manufacturers still produce horn antennas, not unlike the ones used since the introduction of the first radar detector some 50 years ago, Stinger found such technology too limiting. The European company decided to pioneer and master more advanced patch antenna technology instead. And their efforts seem to have paid off. Physically, it has allowed Stinger to make an antenna that is flat (not thicker than a smartphone) and therefore easier to install in the space challenged bumper area of modern performance cars. More important, however, are the performance gains Stinger managed to achieve thanks to the new technology. The sensitivity of the Stinger VIP's HD antenna has become record breaking and now more than compensates for the disadvantages (of the lower mounting position) that remote installation detectors have to deal with. Like no other product, the VIP is able to deal with the most modern, low power, police radars around. Better yet, is the revolutionary accuracy that the HD antenna offers: a measurement precision of 0.0001 GHz is unheard of in traditional radar detectors. Stinger uses this accuracy to better recognize and filter out those pesky false alerts caused by e.g. the k-band Adaptive Cruise Control systems (without resorting to ignoring broad ranges of radar band at the risk of missing a genuine speed trap). Stinger VIP can even safely be installed in many cars where traditional radar detectors would get confused by an in-car radar system such as for Adaptive Cruise Control or similar applications. Stinger attributes several other advantages to their unique antenna design, including optimization for multiple radar polarizations. The brains behind the Stinger VIP is the controller which mounts under the dash measuring 5.551” x 2.543” x 1.102”. Here is where all the power cables, radar detector antennas, the display and optional laser jammer system all connect. Because the Stinger is a radio frequency spectrum analyzer, which is programmed to scan the police radar bands, it is 100% stealth all radar detector detectors and to the eye. And another benefit is that at the press of a button on the LCD screen, you can immediately erase the Stingers ability to detect police radar. Car manufactures have been installing Adaptive Cruise Control and Blind Spot sensors that operate on the same K-band frequency police use. Most radar detectors are unable to filter out these signals and as a result there is an over abundance of false alerts. Because of this Stinger has integrated technology called "In-Car RADAR" which enables their system which is able to block these type of false alerts out. The Stinger VIP system even has an option to log your vehicle's mileage and driving history. You can simply take a USB stick to transfer this data from your VIP to your Mac or PC, and then use the free Stinger Desktop application to manage your trip data, print out reports and even prepare the PoliceCheck files as supporting evidence in court. Why is the Stinger So Expensive? The Stinger VIP is specifically designed for the high performance driver, driving a high performance car, who wants the assurance that the speeding ticket defense system is the very best money can buy. Because of this, the Stinger system is developed using the same military grade technology and components used by our government to intercept sensitive, low power microwave radio signals and analyze the data. The result is a remote mounted radar detector that is stealth to all radar detector detectors and to the eye, which can detect and the alert you of the presence of police radar further than any other radar detector. Your Stinger System will come shipped to your door with everything you need, including an external GPS antenna, external speaker, and easy to follow installation instructions. Stingers desktop software is available for Mac and PC laptops/desk tops. Just start up your Stinger software, insert your Stinger USB drive and download the newest updates. Then plug in your USB drive into your Stinger control box and you’re done. The most unique feature of the Stinger VIP system is that it has the smallest footprint in the industry and is therefore the most inconspicuous. Each head is about the size of dime and smaller than the head of a pin with their new industry exclusive Laser HD Fiber and can easily be concealed in the grill, bumper or literally any conceivable area of your car. When ordering the optional Stinger HD laser heads for the front you’ll receive two pairs of sensors, (two receive and two transmit), which you would mount in the area of each headlight. Note: While the laser jamming system is very good, Stinger has been experiencing some issues in jamming that they have had difficulty in resolving. For that reason, we are currently only recommending the use of its radar detection function. The following graphs are the results from our 2015 Radar Detector and Laser Jammer Shootout demonstrate the extreme performance levels of the Stinger VIP system. Install times/costs vary to the type of installation and vehicle. Your Stinger VIP system has a 2 year factory Limited Warranty and full customer support is provided both through the US Stinger Distributor and by Radarbusters.